Inspired by our boss, Sir Richard Branson, we like to do things a little differently, creating unique experiences in special places. 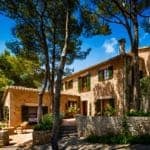 Son Bunyola estate, located on the north west coast of Mallorca and 40 minutes from the airport, is the latest addition to our portfolio, and our first in Europe. The estate is part of a World Heritage site, where our guests can enjoy a blissful retreat in 640 acres of beautiful natural surroundings. Choose from three characterful villas, each completely private with its own heated pool (they are a 10-minute drive from each other). Breakfast each morning, and lunch and dinner on six nights, are all included, served in your villa or on the terrace. Our chefs pride themselves on creating fabulous meals, using fresh local produce wherever possible. Soft drinks, spirits, beer and excellent Mallorcan wines and Cava are also included – we will stock up your villa with your personal preferences. Sa Terra Rotja is located at the edge of our 680 acre estate. It has four bedrooms, each of them en suite, a large pool and terraces with stunning views of the woodland and coast beyond. Perched above the coastline, Sa Punta de S’Aguila has five en suite bedrooms and a similarly large pool and terraces. The coastal views are spectacular. Our most recent addition is Son Balagueret – a four-bedroom property, ideal for smaller families and groups, and packed with character and charm. The turret dates back to the 13th century. All villas share the use of a tennis court, each has a table tennis table and our discreet concierge is on hand throughout to arrange any other activities, spa treatments, restaurant reservations, car and cycle hire, water sports and so on. There are walking and hiking trails from Son Bunyola and a pretty pebbly beach can be reached on foot. Children of all ages are welcome at Son Bunyola. There is no supervised children’s programme as such but we can arrange baby-sitting. Find out more about villa holidays at Son Bunyola – open from mid-March to November – and our portfolio of other unique holiday experiences.